A natural or ‘green’ burial is an old idea that is making a comeback – it is the choice to be buried ‘as is’ (i.e no embalming) in a simple wood coffin or wrapped in a shroud so that our body decomposes naturally. This choice means a lighter environmental footprint than the conventional burial which usually includes a cement or stainless steel vault, elaborate coffin and headstone or marker. Nogies Natural Burial Ground (NNBG) is dedicated to natural burial practices and forest conservation. 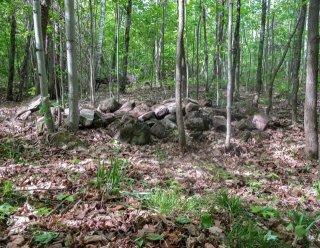 It is situated on 180 acres of private forest, rocks, hills, wetlands and creek near Bobcaygeon, Ontario. It is part of the ecotone known as the Land Between . Trails meander through the forest inviting you to explore the sites, sounds and smells of every season. Burial sites are nestled among the trees where a shallow grave is covered with rocks and stones to create a cairn style grave (see photo of model cairn below). There are no headstones or paved roads - just the forest. The intent is to limit damage to the ecosystem and to allow the natural forest cycles to reclaim and regenerate. When you purchase a burial site at NNBG it is also a choice to preserve this forest for the ongoing use and enjoyment of generations. Send us an email to find out more about how we can help you 'leaf your mark'. Shallow grave for future cairn site. Prepared using using small backhoe. Stones and rocks will be harvested from property to cover grave as in the photo of model cairn above.